In lieu of those big, blown-out conference tournament previews we used to do at the old site—you know, back when we had actual writers and whatnot—here’s a pared-down version from your resident hack (WCHA rant not included.) Apologies to Yahoo college football/basketball hoops scribe Pat Forde for my blatant repackaging of his NCAA hoops league tourney previews. Besides, imitation is the most sincere form of something, someone said sometime. I think it was Carlos Mencia. Friday, March 22: Semifinals at Blue Cross Arena, Rochester, N.Y.
Saturday, March 23: Finals at Blue Cross Arena, Rochester, N.Y.
Keep an eye on: Air Force. 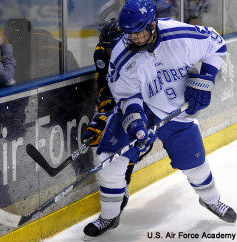 The Falcons, winners of the last two Atlantic Hockey playoff titles, appeared en route to a second-division conference finish after starting the season with a 3-7-3 overall record and a 2-4-1 mark in league play. Since Dec. 1, however, Frank Serratore’s team is 14-4-4 and 13-3-4 in the conference. The pick: Air Force. Niagara jumped out to a fast start and coasted to the Atlantic Hockey regular-season championship, but the Falcons, led by senior forward Kyle De Laurell and junior goaltender Jason Torf, are peaking at just the right time. Meantime, does Niagara hang on to an at-large bid if it doesn’t win the playoff title? My guess is no. The pick: Miami. It wouldn’t be a shock to see Michigan win the playoff title because the Wolverines and improbability seem to go hand in hand and none of the teams still alive in the CCHA played particularly well down the stretch. But the RedHawks get the nod due to their balanced lineup and goalie Ryan McKay, who has a 1.28 GAA and a .953 save percentage in 14 starts since Dec. 1. Friday, March 22: Semifinals at Boardwalk Hall, Atlantic City, N.J.
Saturday, March 23: Finals at Boardwalk Hall, Atlantic City, N.J.
Keep an eye on: Yale. The Bulldogs looked like toast after losing six of seven over a four-week period that started in late January. But senior goalie Jeff Malcolm, who missed all but one game (and a little more than two minutes of a second) with a leg injury, has won each of his three starts since returning to the lineup. 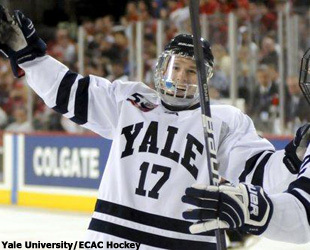 The St. Lawrence-Yale quarterfinal series should be really entertaining. The pick: Rensselaer. Quinnipiac is the safe choice, seeing how the Bobcats have been the class of the league since early November. That said, the Engineers have won nine of their last 10 behind rookie goalie Jason Kasdorf (1.29 GAA, .945 save percentage during that span). Besides, it seems like the law of averages has to catch up to Quinnipiac at some point. Keep an eye on: Providence. It appears I have a tendency to favor teams in this spot that a) are playing well down the stretch and b) have solid goaltending. The Friars meet both criteria; they’re 8-4-4 since Jan. 11 and one could argue that freshman Jon Gillies (a 1.77 GAA and a .943 save percentage in his last 10 starts) is the best netminder in the country. In fact, I might be the one to make such an argument. 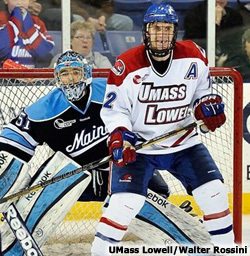 The pick: UMass Lowell. The idea of not picking Boston College in any tournament situation seems foreign to me, but the Eagles have been merely average for the entire second half of the season. Merely average is also an apt description for Hockey East in general outside of the River Hawks, who’ve won 19 of their last 23 games. Thursday, March 21: Quarterfinals at Xcel Energy Center, St. Paul, Minn.
Friday, March 22: Semifinals at Xcel Energy Center, St. Paul, Minn.
Saturday, March 23: Finals at Xcel Energy Center, St. Paul, Minn.
Keep an eye on: Wisconsin. Doesn’t it seem like the Badgers have been up and down all season? 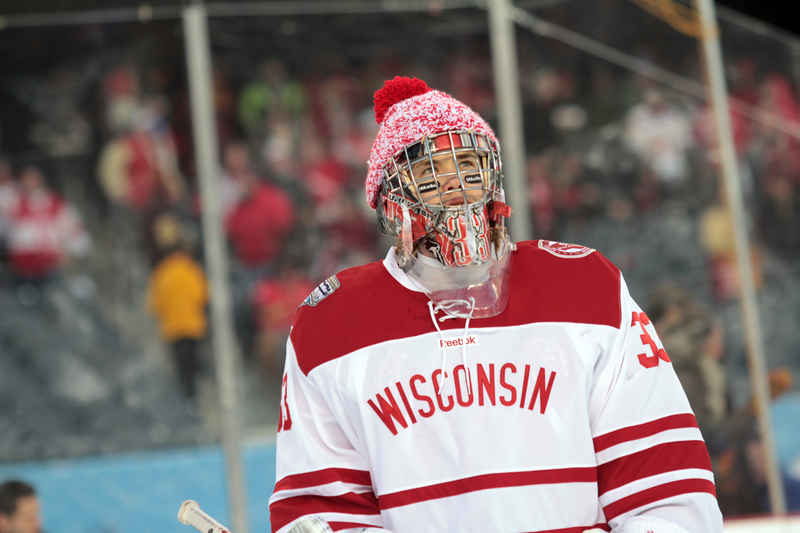 The reality is Wisconsin has been pretty darn good since Thanksgiving, posting a 16-5-5 mark after a 1-7-2 start. Even without senior forward Derek Lee (out with a knee injury) Bucky is as healthy as it’s been all year and its best players (Nic Kerdiles, Joe LaBate, Michael Mersch, Mark Zengerle) are playing well. The pick: North Dakota. One could make a case for six or seven teams to win the WCHA playoff title; there’s really not a big difference between, say, St. 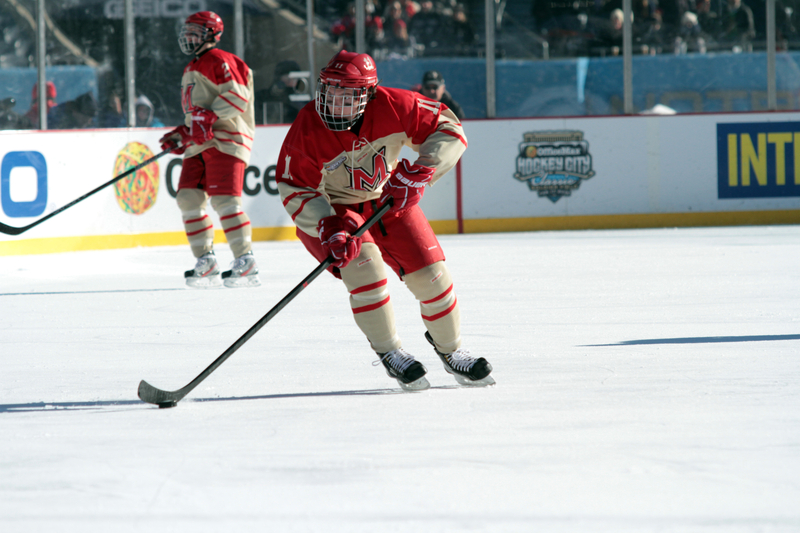 Cloud State and Minnesota State, and no team comes into the postseason on a significant roll. NoDak gets the nod here because forwards Corban Knight and Danny Kristo are the best one-two punch in the conference, winger Rocco Grimaldi has been on fire over the last month, and coach Dave Hakstol made the right choice by going with rookie goalie Zane Gothberg over Clarke Saunders down the stretch.